When we travel to foreign countries, we quickly become representatives of our own country. In its „Ambassadors in Sneakers“ program, the German American Institute Tuebingen creates projects that help young people to become self-confident and interculturally skilled citizen diplomats, who fulfill their role responsibly while having a lot of fun. Our first project – Ambassadors in Sneakers (I) – was a high school exchange program for three German and three U.S. schools between 2014 and 2016. Learn more below about our Young Leaders’ Transatlantic Summer Academy on Human Rights! 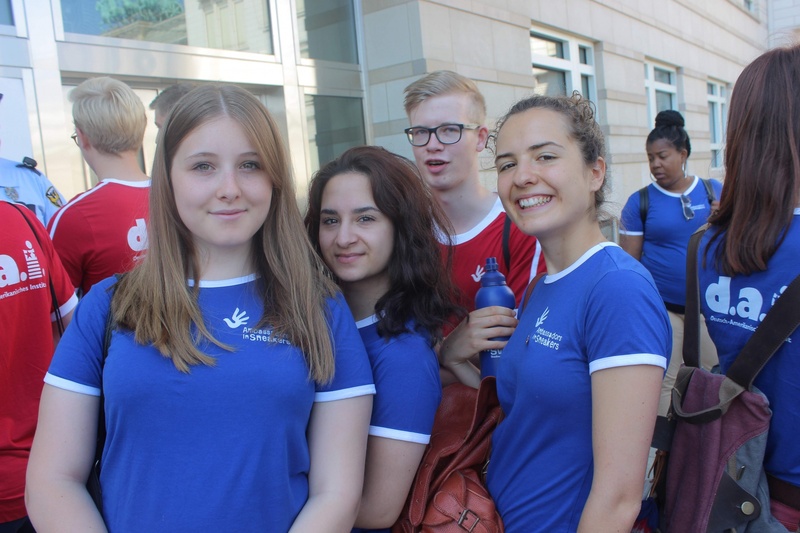 In the summer of 2019, 12 students each from Germany and from the United States will spent four exciting weeks together, learning about youth participation, human rights, transatlantic relations, and intercultural communication in both countires. This year we are looking for current members and alumni of youth councils, youth parliaments, and youth advisory boards as well as other young leaders from Michigan, Illinois, Saxony and Baden-Wuerttemberg. "Ambassadors in Sneakers - A Young Leaders’ Transatlantic Summer Academy on Human Rights" is a four-week educational program that brings together youth councils from Germany and the USA in the summers of 2017, 2018, and 2019. The central focus is on the topic of human rights. It is against this background that participants learn about both countries’ political structures and international networking. While travelling together in the USA and Germany, the young leaders become familiar with important places and institutions that are significant for developing and defending human rights. At a time when thousands are fleeing their homelands due to political/religious persecution, war, and famine, human rights and their violations are topics that young people often question. During their trips, they meet activists, people affected by recent events, media representatives, speakers, and politicians in Germany and the USA, and have the opportunity to learn from them and with them, thus helping gain a fuller perspective on the issues at hand. Each year, new students, ages 16-20, are asked to apply. Applicants need to be members of local or regional youth councils or youth parliaments, mayor’s advisory youth councils, or youth committees. They need to have experience in youth leadership and civic engagement. You are intereseted and would like to apply or get more details? If you’re from the U.S., please find more information on our Call for Applications and use the Application Sheet to apply (young leaders from Michigan and Illinois only). If you’re from Germany, please find more information on our Bewerbungsaufruf and use the Bewerbungsformular to apply (young leaders from Sachsen and Baden-Württemberg only). Click on the image below to find out what "Ambassadors in Sneakers 2018" was like. Click on the image below to find out what "Ambassadors in Sneakers 2017" was like. Our deepest gratitude goes to all our donors and program partners, who make AiS an unforgetable once-in-a-lifetime-experience! If YOU also want to support the "Ambassadors in Sneakers", please, get in touch with us!